Ha! I feel like I hear Chinese people using that with each other even more than 你好吗 though. So would you say “幸会认识您”? – Or is there a better way to construct this? Having done my own investigation, it seems that “幸会幸会” is sufficient on its own. Keep in mind that 幸会 is quite formal. You just don’t really need to say anything. I’ve had some people tell me “很高興認識你“ before, but usually just no one says anything. John, I met a Chinese lady from Jiangsu province a few days ago at a bookstore. I asked her about this greeting “ni hao ma?” since I had heard Jenny (ChinesePod) make the same claim. The lady from Jiangsu said they in fact do use that greeting when they are making casual talk. My guess is that China is too large of a country (in terms of population) to expect any single greeting to stick. Keep asking people. I’m sure you’ll get a wide variety of responses. Keep in mind, though, that you can never totally trust a native speaker… Empirical observation is best. For those outside of China, it might be worth mentioning that 你好 is alive and well, just that it doesn’t mean what language learners are usually taught it means. A while back there was this article in the Journal of Asian Studies that talked about the role of 你好 changing along with Chinese society. Here in Malaysia it is common for Chinese friends to greet each other with the abbreviated 好吗? 你好吗? is reserved for more formal occasions or with strangers. In the US everyone learning french knows at a very early stage the expression “comme ci comme ça” which, in fact, is never used in France (except to make fun of the american students of course). so, but how do Chinese people ask each other how they are? I think I remember 你(最近)怎么样? Is this right? What else could I say? I think you’ve got it, Omno. I hear that much more often. I have the same problem when speaking English to Chinese people. Even slight deviation from the standard “How are you” results in massive confusion. My standard greeting for other Americans is “What’s up?” and this REALLY confuses the Chinese folk 🙂 “Up?” Huh? I’ve observed native speakers using ‘Nǐ hǎo ma?’ with one another, but in situations where the asking party knew that the askee had recently NOT been good, or had been ill. Pragmatically, it seemed to be a polite way to inquire after someone’s (poor) health. Very anecdotal. I’m curious if anyone else has noted something similar. Ze, I think so, too. I heard it used to check on a friend after they tripped on the sidewalk tiles, me being that friend most of the time! I love freaking out my students by asking, “so, what’s new?” At first I was surprised by how freaked out and confused they got, I mean, put the words together and it makes sense (unlike “what’s up,” which makes no sense). But it really throws them for a loop! Like ze said, I was always told that you only ask 你好吗 if you really want to know how the person is doing, like, when you want to have a deeper discussion because you know they have had some problems recently. But I’ve never observed this personally. Nice post, I fully agree. It seems that a slow and pronounced “ni hao ma” is often used by Chinese as a test balloon whether their Western opponent is at all capable of hearing and speaking. Unrelatedly, “leih hou ma” seems so be somewhat more common in Hong Kong. What I really wanted to ask: John, a couple of years ago, you wrote a piece on what what Chinese consider acceptable of turning in, e.g. as a project result. There were some stages (expressed in percentages) at which judgements like “could do”, “pretty good” and “perfect” were made. I can’t seem to find it, but don’t really know what to search for either. Do you know what I mean and could you point me towards it? Much appreciated. I agree with ze. Not only have I heard it used several times in this context, but also if for example someone has recently lost a friend or relative. I have also heard it used by Chinese in a situation where they meet someone they haven’t seen in a long time (e.g. maybe one, or even several years) and they’re enquiring about how that person’s life has been during that period. @Onno, you are right. Here in Malaysia, we Chinese do sometimes greet each other by saying 你最近怎(么)样? but only with those who are close friends or we are familiar with. Otherwise with strangers we are likely to say 你好吗? From my taiji teacher, I was taught, “吃了吗？ which apparently goes back to time when food was scarce. 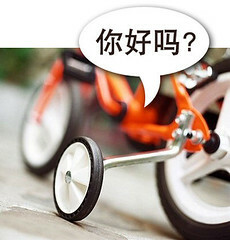 你好吗 : training wheels for learners. Yeah, that’s a great metaphor, i agree on that. After reading your post now i realized when i had started learning chinese, i was frequently using that “training wheels” and the response i got from my teacher was always an acted, pretended one. She was saying: “我很好,你呢?” in a very slow and pretended way. I never heard my teachers greeting one another using that phrase and i assure you i’m a kind of stalker when it comes to chinese, watch chinese people to see how they speak, how they use the words i study and how they pronounce them. I rarely heard them saying 你好吗 and even if they did, they did it in an acting way to the students or joked imitating basic level students. Great post! I recently put together a beginning-level course and thought about several of these issues. But putting in 你好吗？ into ch. 1 won out for the reasons above. It was so nice to see them discover & understand how to use 吗，and then other particles, all because of the beginning in 你好吗。 We even pretended to make English questions by adding 吗 to English sentences to help solidify the 吗 concept. It’s a 5th grade class. If I were teaching high schoolers, it’d be different. “你好吗？ 很高兴认识你。” are English Chinese. I noticed that “ni hao” is used as well for calling someone’s attention, like “Nihao! Fuwuyuan!”. Nice article. I’ve been learning Chinese for about 6 years now and I’ve never even used 你好吗 in a serious conversation. It just sounds unnatural to me. I’ve always been partial to things like 今天怎么样? or 吃了吗? I think everybody should read a post over at Albert’s Laowai Chinese that deals with 你好 as a greeting. Do also read the comments, because lots of people (including native speakers) have had their say. In short, it seems like 你好 is indeed used even when foreigners are not involved, but it differs between different people and different places. 你好吗? Is much closer to How are you holding up? then How are you? Drives me crazy that they put that in the textbooks. I have been using 干嘛？ as a greeting lately – especially on the phone. Why don’t they use that instead? Probably too informal. I don’t think you need to oversimplify things to make them understandable. When I used to teach What’s up? in class they would understand immediately. What’s up? = Hello. Done. Not rocket science. I think “zenme yang” should be more detailed, like 《[你]过得怎么样？》 or something like that. I think greetings like "how are you" is rarely used in Asia. Well it is sometime used but not as primary greetings. I would rather suggest a simple Hi, Hello, Good morning, Good day. 你好 is formal，like “nice to meet you.” Chinese will say it the first time see another person. 幸会 is a bit literacy from ancient Chinese more commonly used by male. If you want to greet aquaintances, you can ask “吃饭了吗？”or “上哪儿去啊？”And we don’t have expressions like “have a good day! “when you want to say good bbye.